Most bridges used in gaming are fairly small with only enough width to handle one or two vehicles side by side. This is usually all that is needed, but sometimes when the scenario requires it a much larger bridge is called for. 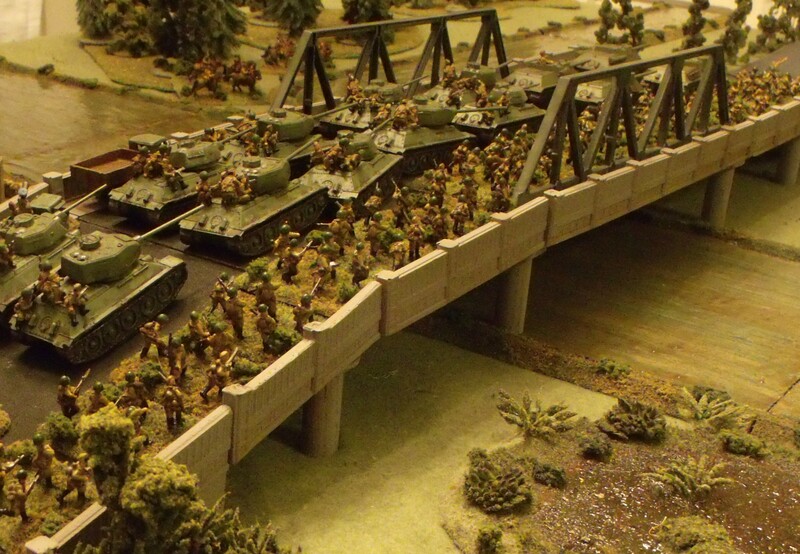 This is a fairly simple conversion that can be done to most gaming bridges. The details on most bridges is all on the sides, so it’s fairly easy to widen a bridge. The first step is to simply cut it in half. We then cut a notch into the sides to increase the surface area and make it a stronger joint. A new wider deck was then added. If this is being done with a stone bridge then, replicating the stone texture would be the hardest part. We simply glued some fine grit sandpaper to the new deck and painted it black. New support piers were made using some wooden dowels. A few comparison pictures of the original bridge sections and the modified ones. The Truss is an HO scale Model Railroad one that we got from a local hobby shop for under $15.